Born 1958, lives and works in Paris. Video artist since over 17 years, Loïc Connanski is quite unclassified as a contemporary artist. He is also rather disturbing. His method of working is one of derision. 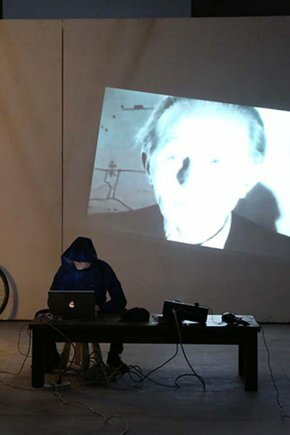 Connanski's technique of auto-filming is close to that of Nelson Sullivan, the New York based video artist. He is the anti-thesis of the political correct in that he always says what he thinks, quite directly. Connanski is also what he says himself an "ego hunter", hunting the egos of the art world, and asking them the simple questions around their work. He is an intellectual who works with the negation of the intellectual discourse. He started recently to realize performances, although one also can see his video work as performances in front of a camera and then broadcasted on French national television. He has a corrosive humour where the pre-dominating quality is his love for language. His preferred target is television, around which he procedes with a complete demontage of appearances and the "labyrinth of illusions". Loïc Connanski, France. Duchamp & me. Guangzhou Live 5. 2014.